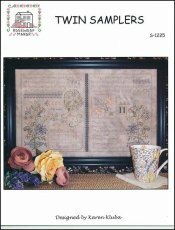 Twin Samplers [H5710] - $15.00 : Yarn Tree, Your wholesale source for cross stitch supplies. Cross stitch pattern by Rosewood Manor. A delicate looking sampler featuring a verse taken from a book about antique sampler verses. Accented with of flowers and patterned bands. Also includes two mini designs, extra borders, and an alphabet for personalizing your work. Stitch count for sampler is 268 x 166.